We’ve recently redecorated our whole house from top to bottom, all in the space of 12 months. It’s been a long ol’ slog, but one thing that kept me going, was getting to the end stage and doing the ‘finishing touches’. The part when family photos get hung, cushions get arranged and plants be placed. This excites me….probably way too much that it ought to, but isn’t that part of the ‘fun’ of getting ‘old’ – finding joy in the little things. Pinterest is a dreamy world of idealism that I occasionally lose quite a few hours immersed in interior designs, life hacks, recipes and DIY projects that I have the full intention of making…..one day! – Anyway back to my plot – it was on Pinterest I saw a forest scene canvas print that I completely fell for. I clicked through a million follow through links to eventually reach a website (that shall remain anonymous) but when my eyes found the price and cost of postage, I did a gasp and shut the laptop down. I’d rather have a blank space, I thought. Fast forward approx two months later, I received an email that made me squeal in pure excitement. It’s a beautiful thing when a blogger and a brand can come together with THE perfect product with THE perfect timing. So I introduce www.photowall.co.uk – a Swedish company that specializes in wall murals and canvas prints. 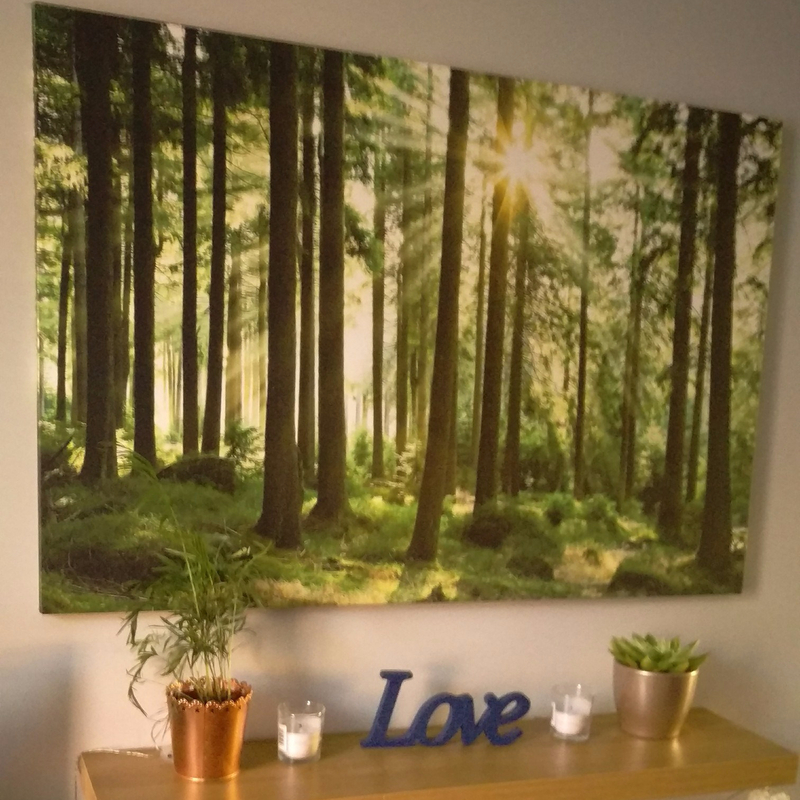 When they approached me to work with them to review their service and in return to be gifted a canvas of my choosing, to be honest, I was sceptical. I’d never heard of them so I decided to do a little detective work. I googled them. To my surprise their website was incredible. There were canvasses arranged by colour, designer, rooms and categories from animals, cities, maps to vehicles. I was instantly drawn to the ‘nature‘ category and then I spotted the sub category of ‘forest‘ and clicked without hesitation. I was presented with 475 various forest scenes. I saw THE ONE and was so surprised at the pricing and the fact you could also choose the exact dimensions you required. It took no time at all to order. The following week it arrived and we put it together straight away. The first thing I noticed was the quality, all their canvases are made with 100% cotton, they are environmentally friendly, fire retardant and will not fade in sunlight. The paper guide to putting together the DIY frame were very clear and we also watched the full video tutorial that is available on their website. It was very quick and simple and our canvas was hung on the wall within 15 minutes. It has been the perfect finishing touch to our living room. Since then I have been bookmarking all my favourite prints from their website for the rest of our home and with free Worldwide delivery, Photowall.co.uk is definitely a new firm favourite. If you have made it to the end, high five!!! – just for you guys I have been sent a coupon code that gives you 20% off all products on www.photowall.co.uk – enjoy! Don’t forget to tweet, tag or message me what you purchase. I would love to see what you choose! Disclaimer: This product was gifted to me by the company. I will only accept and feature items that are in keeping with my blog. On the rare occasion that a post contains all gifted items please rest assured that it isn’t sponsored. All sponsored and collaborative posts are clearly marked. I try to keep my posts as fair and professional as I can if I do not like a product I will state that I didn’t find it suitable for myself but that does not mean it’s bad or won’t work for you. Please bear in mind that blogs are a matter of opinion at the time, not fact. I just love this print. It is so gorgeous! I might have to get one of these for our wall. Wow, what a statement piece. I love the size of it, and it’s a perfect centerpiece behind a sofa. The print is very pretty. It looks like the sun is reflecting off of it. I like how you put it together yourself. Artwork always brings life into a home. Your print looks lovely and something to enjoy looking at for years to come. This is a beautiful print. I will have to check them out. We will be changing up our pictures this winter. I like to change things up when the weather changes. I love the photowall! Perfect for design and it looks very calming! Wow it’s beautiful! It’s fantastic how you could set it up so quickly upon delivery! So simple! Wow, that’s a great picture for a photo wall. I love that the sun ray is captured so nicely. What a beautiful photowall! I will have to look into this brand. I love the print that you picked! It really brings the whole decor together, it’s also very soothing and relaxing to look at! I really love this one! It has so much to add to any project. I love the photo of the forest with the sun shining through. What a great way to add freshness to a home! This print is gorgeous! It brings a bit of nature and colors in the home! That is a beautiful piece of art that you have there. I love the print. Reminds me of art works my grandmother used to keep in her place. I love this idea, I just ordered a print and now need to put it on canvas. I love your print. The print is beautiful. I love the way you set it up so simple yet so pretty. That’s so cool. I love decoratives such as those! Makes the house more awesome! Definitely would make a wall stand out. I would love one in my home. Interesting! I’ll check this one out and I love that it’s personalized. Awesome! This is so beautiful and soothing to look at.